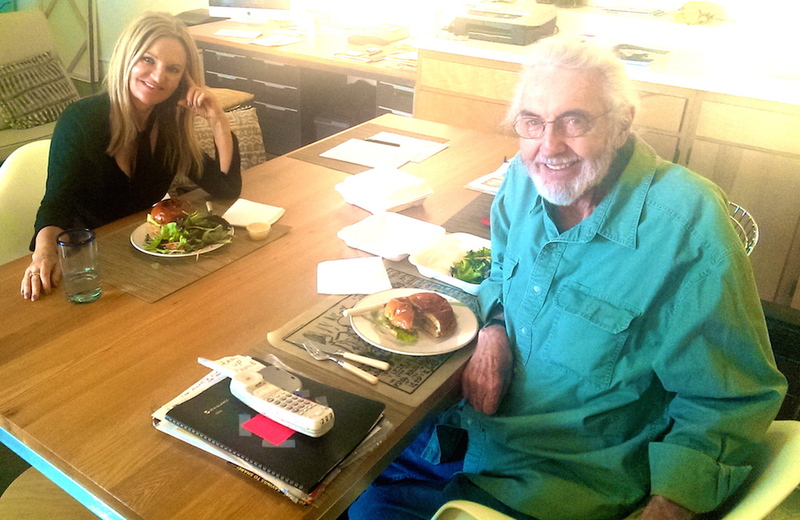 Roland Reiss and Lita Barrie in the artist's studio in the Brewery, 2014. Raphael Rubinstein insists that the major difference between an art critic and other critics -- like literary and film critics -- is the stimulating artist-critic dialogue in studio visits that underlies art writing. 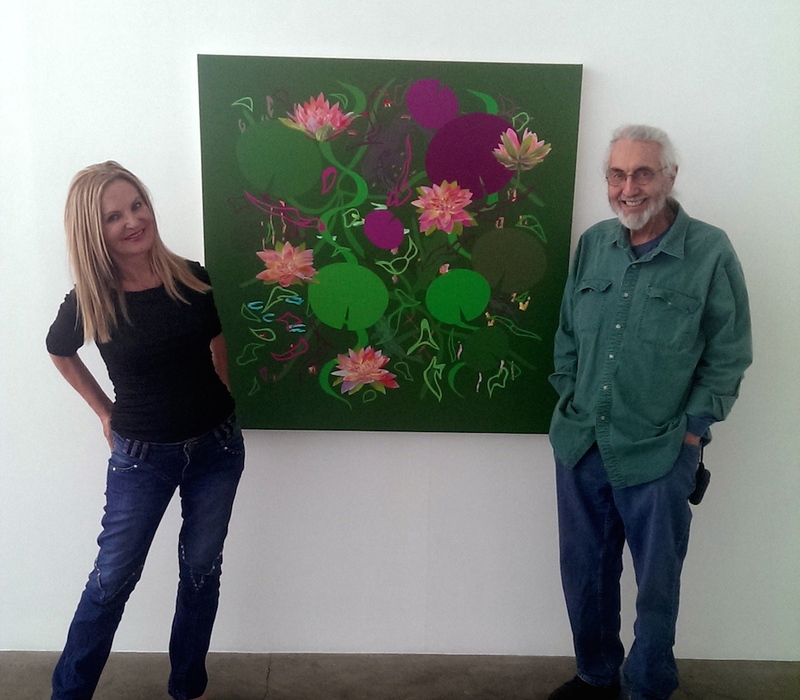 This summer, I made four visits to Roland Reiss' studio to discuss his new Floral Paintings --which will be on public view in his upcoming retrospective at Begovich Gallery, California State University, Fullerton in November and a large exhibition in Los Angeles at Diane Rosenstein Fine Art in December. A magnificent 260-page book lavishly designed for international distribution with essays by Howard Fox, Dan Cameron, Mike McGee, and myself, will accompany the retrospective -- along with an artistic film by Eric Minh Swenson. It is radical for an artist who was at the forefront of the plastic movement in the 1960s, ahead of the semiotic curve in dioramas in the 1970s, and breaking ground in abstract painting in the 1990s, to make a 180-degree return to representational painting after 2000 -- with the most beautiful imagery of his career. In the new Floral Paintings, Reiss aims "to put everything I have learned about painting into a painting." 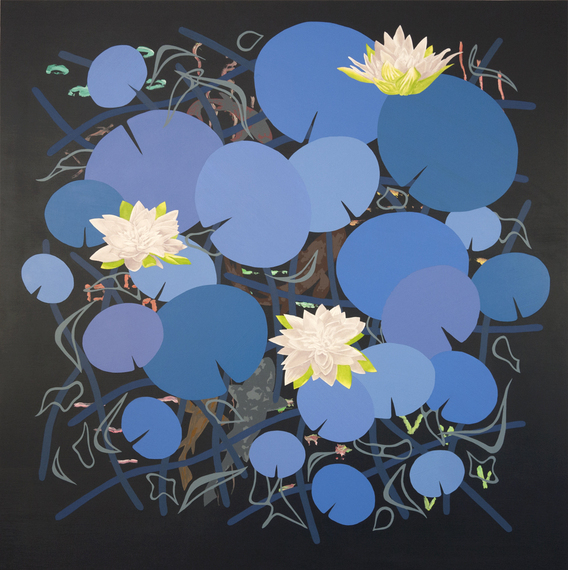 Lilies In Blue: 2014, 44" x 44", oil and acrylic on canvas. The Floral Paintings live up to his aim. Reiss prizes the "mental and psychic scale of space," insisting that, "the deepest part of painting is entering the consciousness of the painter." As he says, "we can choose to live in a large space or a small space. It is a powerful metaphor for how ￼we see the world." Reiss' Floral Paintings show how spatial fecundity brings painting to life. It is the experience of space that gives painting its vitality, making it appear alive in the moment. Bernard Berenson began the critical dialogue on the positive effects of "space composition" in the experience of art, arguing that "Art comes into existence only when we get a sense of space not as a void, as something negative, such as we customarily have, but on the contrary, as something very positive and definite, able to confirm our consciousness of being..."
For Berenson this "consciousness" in painting is based on what he calls "space composition," which "dissolves us into the space presented." Decades later, Susan Sontag also emphasizes "consciousness" in an idealistic view of the purpose of art, very unlike the cynicism of dominant tenets of postmodernism over the past few decades. Paradoxically, their idealism is more relevant to the élan of our times, because people are tired of superficial media images and long for deeper experience. Reiss' Floral Paintings are in sync with the times because they have a spatial depth that creates emotional depth. 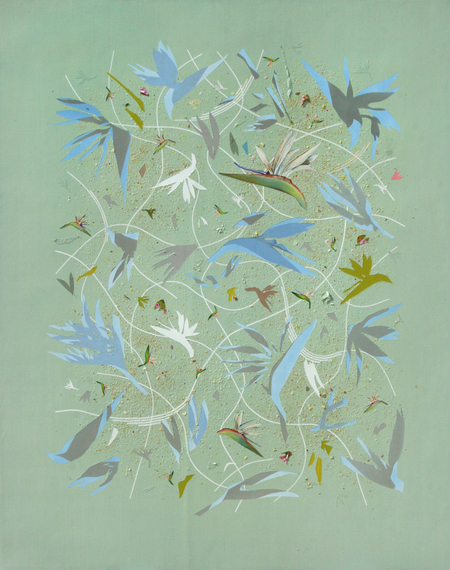 Blue Birds: 2011, 52" x 40", acrylic on canvas. Frank Stella echoes Berenson by insisting "the aim of art is to create space." Stella was saddened by the "shallow-surfaced paintings of the past 15 years so excruciatingly dull and unpromising," and turned to making sculpture. Hockney argues in contrast that Stella's view is fascinating but flawed, because it does not deal with the way a flat surface can appear three dimensional to a viewer through the crucial spatial tension between illusions of depth and spatial ￼possibilities the viewer discovers -- recalling da Vinci's distinction between "natural" and "artificial" perspectives. Reiss' lifelong exploration of deep space that evokes deep emotion makes his work both historically grounded and contemporary. Artists who are concerned with thoughtful questions about the purpose of art always work in this vein by raising perceptual, conceptual, optical and philosophical questions about physical space as defined by the science of their time. However, the disappointing current shift in painting made for commercial distribution through online media leads to a worse disregard for spatial depth than Stella criticized in the mid 1980s. Contemporary artists who disregard the sensate experience of art -- which happens in the physical space between the viewer and the painting viewed -- cheat the viewer of the emotional experience of spatial depth serious artists value. Since the 1960s, Reiss' interest in the German philosopher Conrad Fiedler has led him to a more conceptual approach to the exploration of different perceptions of space and to an understanding of the way meaning is achieved visually as "perceptual cognition." Sunflowers In Sunshine: 2013, 68" x 52", oil and acrylic on canvas. 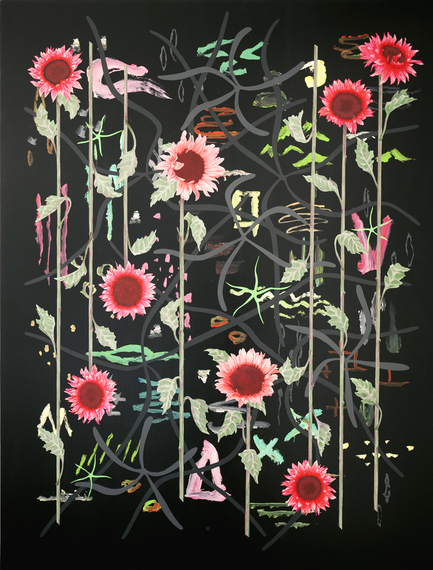 In the Floral Paintings, Reiss uses the flowers as a scaffold to create in-between spaces where surprising things can happen. The flowers float in the center of these paintings like a galaxy. Reiss juxtaposes multiple perspectives of space, as both flat and infinitely deep. Viewed from afar, the human-scale flowers, bursting with vibrant translucent color, are experienced in a body-scale relationship. Viewed from a close focus, tiny surprising details are discovered in the gaps between the flowers. The play on large and small scale, telescopic and microcosmic perspectives, resembles a zoom camera lens that keeps the viewer's attention moving up, down, around and across the painting, making perceptual connections between the "clues" in the background details and the beauty of the dramatic flowers in the foreground. Reiss keeps the "static" of different textures in the background to create spatial tension -- unlike painting that relies heavily on computer technology and loses the tension needed to create depth. He holds the viewer in suspense, discovering surprising details that vibrate in the gaps between the galaxies of floating flowers. Reiss' deep space is filled with lively vibrations that parallel the quantum mechanics theory that there is no void in space. Today, quantum physicists refer to this concept as "zero vibrations of vacuum," meaning there is no such thing as absolute vacuum or void because space is filled with vibrations of energy. Reiss turns his back on the cynicism that currently dominates the art world and pursues his cherishment of the translucence of floral color. Of course, flowers are signifiers of emotion and the most widespread way people communicate feelings of love, admiration, sympathy, compassion and regret for one another when words are inadequate. For Reiss, color is the most ephemeral aspect of painting because "color takes us to a deeper consciousness" -- and the major concern he shares with his hero Matisse. Flowers have a translucent color with more dimension because we look into their color, beneath their surface. But Reiss also invents surprising colors for familiar flowers: his poppies can be blue, his sunflowers can be pink, and his birds of paradise can be crimson. Sunflowers at Night: 2013, 68" x 52", oil and acrylic on canvas. Reiss goes beyond the symbolic and cultural meanings usually assigned to color, using dense expanses of translucent color for spatial composition. His anthropomorphic flowers are usually frontal, with a human scale that gives them personality and presence, so that the viewer has a one-to-one body relationship with them. Reiss' first floral painting has a vase, the next painting has a bouquet, until he gives up traditional flower arrangement altogether and begins exploring compositions with flowers standing upside down and scattered diagonally -- not behaving in space as flowers normally would, but like thoroughfares in a map taking us on a visual journey. His pink sunflowers reach for the light and his water lilies are seen vertically, rather than from an aerial perspective. 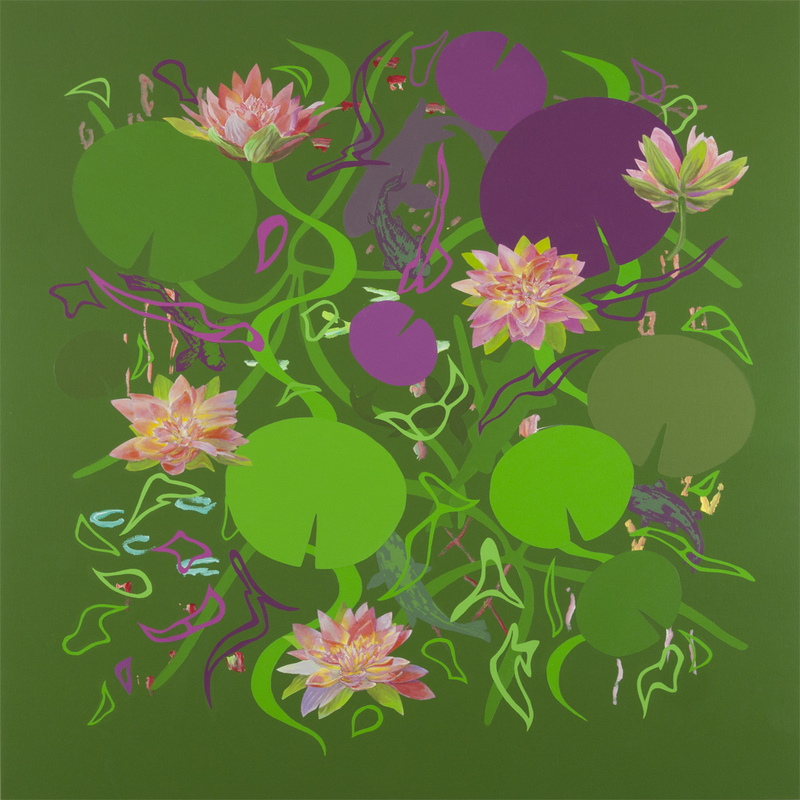 Reiss' luminous flowers are contemporary, in-your-face flowers; he uses them poetically as abstract shapes and expanses of dramatic color to create depth and subvert scale. He often uses transparent glazes painted on a neutral linen-colored background to create illusory space. Reiss believes that contemporaneity is vital and that "artists also need to feel a connection to the history of art." Behind the contemporary flowers are references to earlier forms of painting: figures stenciled and stripped from Matisse, Picasso, Cezanne, Delacroix, and Kahlo. Reiss uses excerpts from his experience of disparate things he loves: cartoonesque water shapes, skylines, satellites, military camouflage, spaceships, waterfalls, butterflies and astrological symbols. Descanso Dream: 2014, 44" x 44", oil and acrylic on canvas. Monkeys replace humans, birds of paradise morph into background silhouettes of birds, human figures fall from space, and airplanes replace insects (recalling Dutch Still Lifes) to shift the scale and suggest that space is bigger than we think. Flowers, of course, signify a gift. Reiss' Floral Paintings are the gift of a master of spatial depth who has a place in the history of spatial vocabulary -- which, Berenson argues, is the measurement for judging gifted painters. It is Reiss' visual exploration of the aesthetic philosophy and emotional psychology of spatial depth that links his Floral Paintings to the past, makes them relevant to the present, and ensures their continued influence on future contemporary painting. Lita Barrie with Roland Reiss in his studio, standing beside Descanso Dream, 2014. 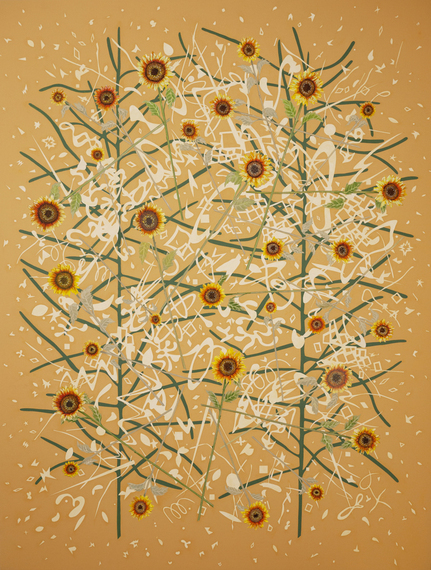 After a decade working quietly in his studio on the Floral Paintings, Reiss is about to move into the limelight again. Reiss' upcoming retrospective, exhibition, book and film are long-awaited opportunities to revisit an exemplary artist who is an inspiration for two generations of Southern Californian artists. But for me, the studio visits over our long lunches were more than research for art writing; they were further education in the language of painting directly from the "consciousness" of an authentic artist, the basis of a lifelong friendship, and an exemplar of the deep artist-critic bond that Rubinstein insists makes art criticism so different from other forms of cultural criticism.